WASHINGTON (CNS) — Acknowledging the real challenges and burdens the U.S. bishops face in their ministry, Pope Francis shared with them his own experience as a pastor and urged them to keep their eyes focused on Jesus and their hearts open to others. 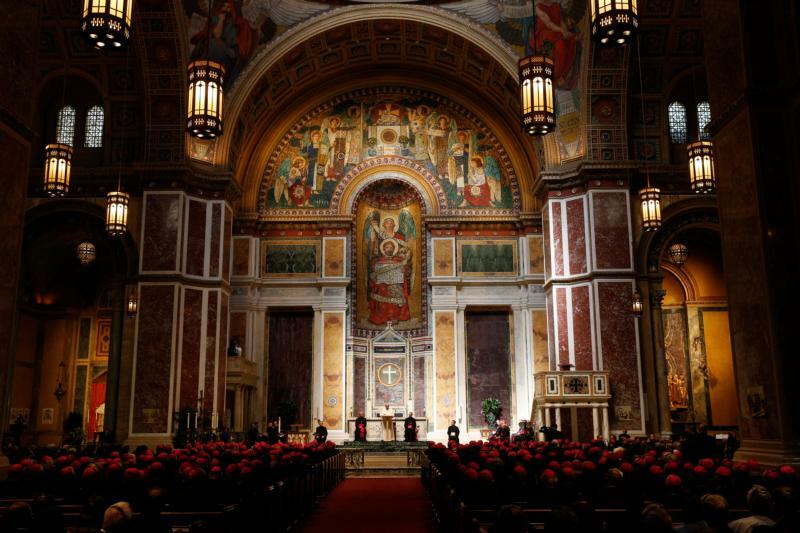 The 78-year-old pope met the U.S. bishops Sept. 23 in Washington’s Cathedral of St. Matthew the Apostle for midday prayer. His speech to them, delivered in Italian, was expected to be among the longest of those he would give in the United States. “I did not come to judge you or to lecture,” the pope said, but he wanted to address the bishops “as a brother among brothers, ” one who served as archbishop of a large, diverse archdiocese and now, “in old age,” is called to encourage Catholics around the world. 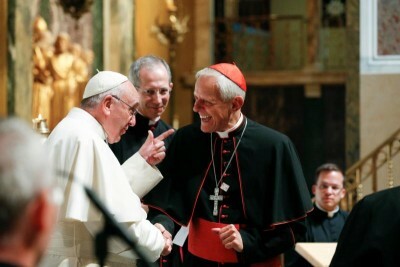 The pope also was welcomed by Washington Cardinal Donald W. Wuerl, who rode with Pope Francis in the popemobile part of the way from the White House to the cathedral. Dozens of office workers in high-rise buildings around the cathedral pressed their faces or smartphones to the glass windows in hopes of getting a better glimpse and photo of the pontiff on the steps leading up the cathedral. In his speech, Pope Francis focused on the basic qualities needed in a shepherd, a pastor called to share the good news of Jesus Christ and God’s mercy in word and deeds. He also praised the bishops’ defense of the unborn and the U.S. Catholic community’s history of welcoming and assisting migrants and refugees. Pope Francis also acknowledged the “courage” and the “mortification and great sacrifice” made by the U.S. bishops as they came to grips with the clerical sexual abuse crisis and its impact on survivors. “I realize how much the pain of recent years has weighed upon you, and I have supported your generous commitment to bring healing to victims — in the knowledge that in healing we, too, are healed — and to work to ensure that such crimes will never be repeated,” he said. The ministry with which they have been entrusted is God’s, not theirs, he said. Compassion, joy, inclusivity, simplicity, dialogue, self-giving, mercy and humility must mark a bishops’ ministry, the pope told them. “As pastors, we know well how much darkness and cold there is in this world,” he told them. But the church can attract people by being “the family fire” that offers warmth, comfort and community. Encounter and dialogue must be the hallmarks of a bishop’s interactions with others, especially with those who hold differing opinions, the pope said. Dialogue is not “a shrewd strategy” but the path Jesus chose to offer his love to all people. Contributing to this story was David Sedeno in Washington. PREVIOUS: Pope, ‘son of immigrant family,’ tells Obama he’s ready to learn in U.S.